For the first time ever Twitter has made a profit. It’s only taken 12 years! The news sent shares in the company soaring. The turnaround is being credited to the changes Twitter has made to advertising, especially video advertising and the fact that the social media platform has become more ‘pay to play’. Despite making a profit user growth has remained flat and this has been partly attributed to the crackdown Twitter has made on fake accounts. At the moment Twitter has 330 million active users a month, which is a rise of 4% compared to 2016, but no change on the previous quarter. What does this mean for Twitter business wise? Well, I’m really not entirely sure, so this is where I hand you over to Business Insider to speculate on what this could mean for the future of Twitter. 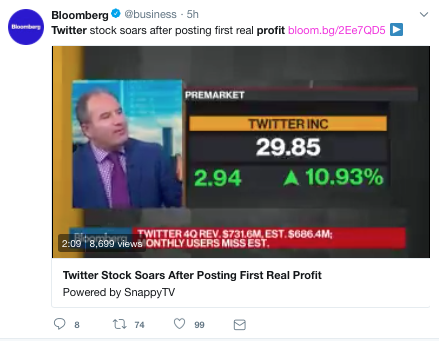 Read what Business Insider thinks in their latest article ‘Investors love Twitter again — but their excitement could scare off any potential buyers‘. 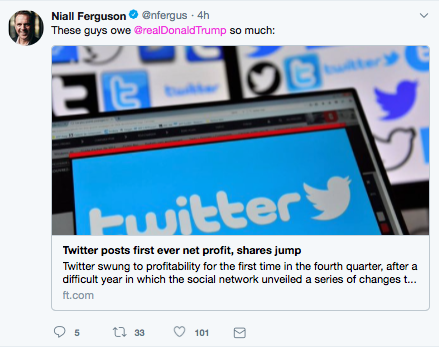 So this is what the business world is saying about the news, why not check out what people are saying about Twitter’s profit on Twitter. Personally I was really surprised to hear this was the first time Twitter has made a profit. I knew it had struggled over the years but obviously I had no idea to what extent. How has Twitter, a social media platform that has integrated its way into everyday life, not made a profit in 12 years? I found a few articles that explain why, you can read them below. Marketplace – How in the world is Twitter still not making any money? BBC News – How does Twitter make money? Twitter isn’t the only social media platform that’s struggled to turn a profit, Snapchat is also facing similar issues. Read about it in TechCrunch’s article ‘Twitter is now worth more than Snap’. 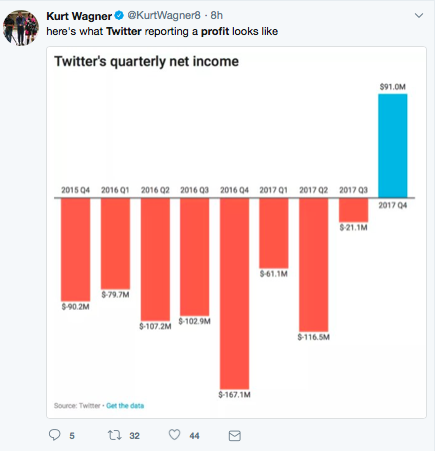 What do you think about Twitter’s profitable end to 2017? Is this the start of even more advertising on Twitter? I’d love to know what actual users of Twitter think, please share your comments with me!